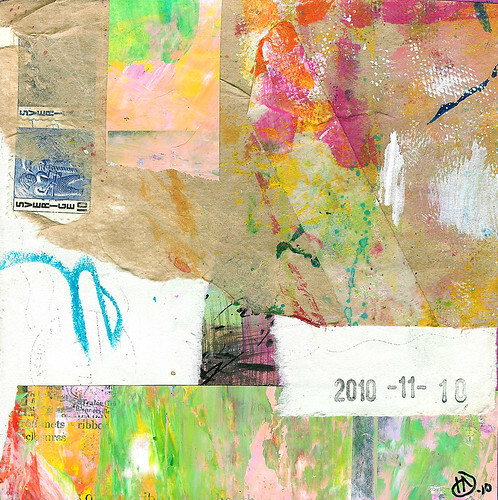 Collage from 5 -12th of November 2010, ongoing Art Every Day this month by iHanna. I should call my project art every second day, because that is what it always becomes. I am not an every-day-kind of girl no matter how much I try, I just am too tired some days. Or I prioritize other things, like reading in bed in the evening when I come home. But I don’t mind. I keep going. I am persistent. I keep coming back. I keep wanting to fill that square surface with my own ideas. Wanna see each of the collages, they are after the jump! My least liked are #5 and #12, but all the rest are kind of new collage favorites. 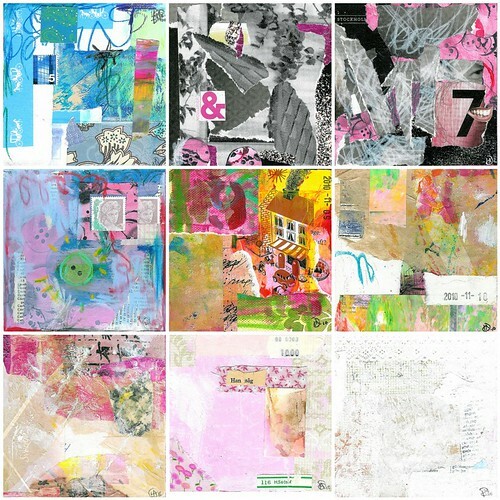 I really like the two last ones above, pink and white collages. They are so very light that they almost don’t have any contrasts. They look way cooler IRL, because of the gesso and paint texture but they didn’t come out very nice scanned. They’ve all got their titles written on the back. They are: 5 November: What a ride it was, 6 Nov And now what, 7 Nov Seven button smile, 8 Nov Happy birthday wishes, 9 NovOn our street, 10 Nov A few of my favorite things, 11 Nov Diffusion, 12 Nov Visibility and 13th of November Breeze. 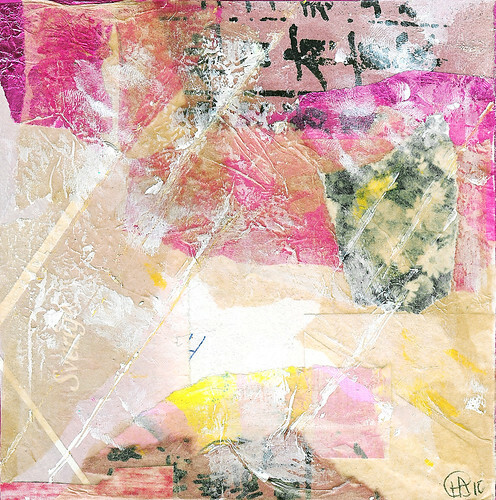 All collages are available for 20 USD/each, and that includes shipping. But I won’t put all of them up my Etsy Shop, I just don’t have the time, please just let me know which one you want and I will send a paypal invoice to you directly! These four collages are also for sale, in case you liked those. PS: Creative nudge #10: collect good words. Do you collect words? I do, I do! One of my favorite words is chandelier. Another favorite is a abundant. Check in what others are doing at day 18 of Art Every Day month too. 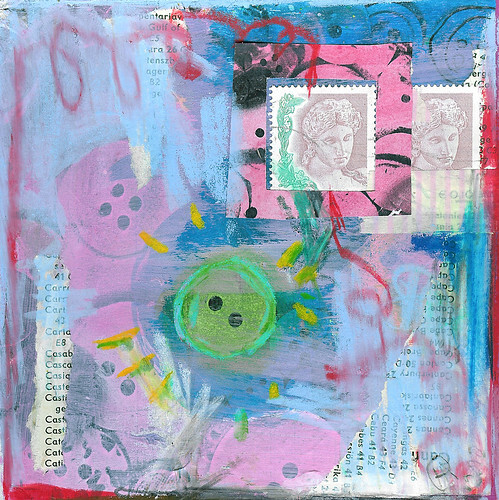 This entry was posted in A Creative Life, Collage, Creative habits and tagged aedm2010, collage artwork. Bookmark the permalink. I am inspired to try the scribbly thing ya got going there on top of the art work. Is that pastel? Crayon? Adding just one more dimension to an already gorgeous landscape, is very creative. I love it. because somedays that’s how the dice roll. I am a word collector too. 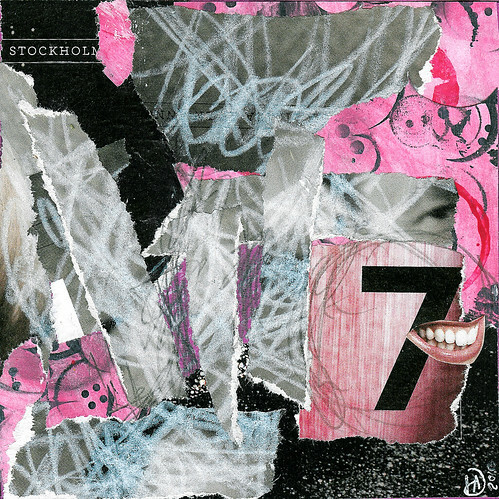 I love those smiling lips coming out of lucky number 7!! I love all those layers. 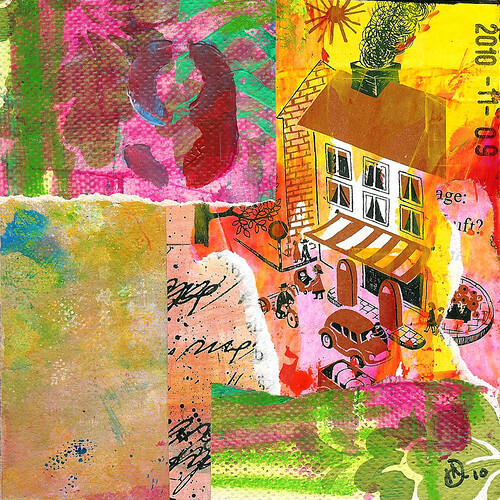 Collaging is great fun – nice to get all sticky every once in a while! Genevieve, thanks! Scribbly is one great word too (as is translucent), yum! It is white crayon (caran d’arche, mah favorite). Art Every Coupla Day sounds nice, but will it keep you going/creating for Every Day? Maybe Art FOR every day is my way? TJ, hehe, I didn’t think about the lucky number thing, but you’re right, it is a smiling number. Hihi. I love the all-white collage! It’s very unusual. 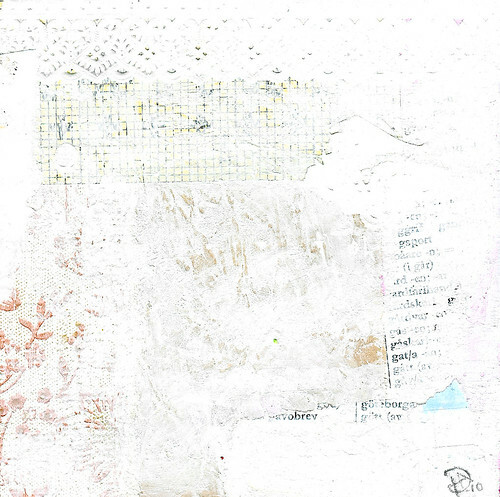 You started me on the art journal path. It’s very liberating. I’m a writer, but I don’t put any words on my journal art. I just want the pictures at this stage. Is this common? these actually look really interesting when grided together as you have sown at the top. could be a fun way to display them. my favorites are the one that say “han sag” because i think the subtlety of color is lovely and the one with the little street and buiding hiding there because it has a playful quality. and art every other day is still pretty awesome! the center piece is my favorite! you have such a talent for collage! Love them- especially the last one. The white is gorgeous. Here’s the deal: Just keeping going is the most important thing! We all love the neat idea of making something every day. But even the people who have done that for a month or a year, say that they wouldn’t do it again. It’s a GREAT discipline! But something happens to my art when I try to do it. I don’t like it as much. I’m just a person who needs to let things germinate, I guess. I always love your collages. Fun. That’s what they say! I love all of these especially the one in the top left and all in the middle row. 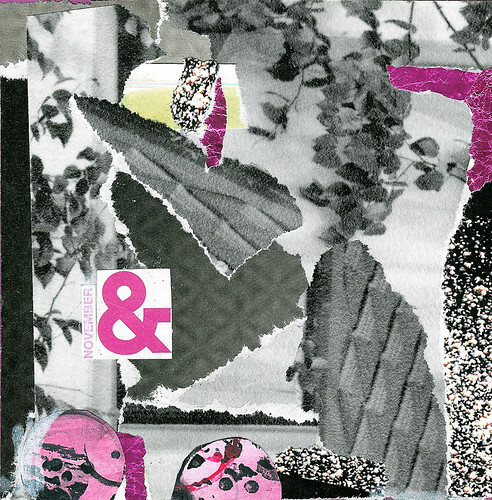 great collages, Hanna ! So juicy with little surprises here and there. Love your collected words! Want to start my own collection ! You are at the top of my blog list and I read your blog all the time and you are a true inspiration to me. 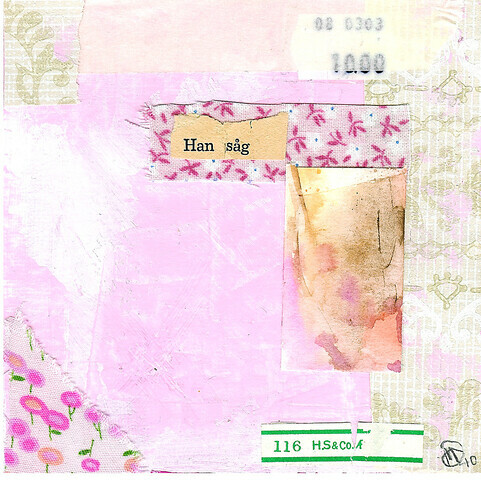 Collage is a #1 creative love for me and I am doing a 4X4 every day this month and hope to keep it up. 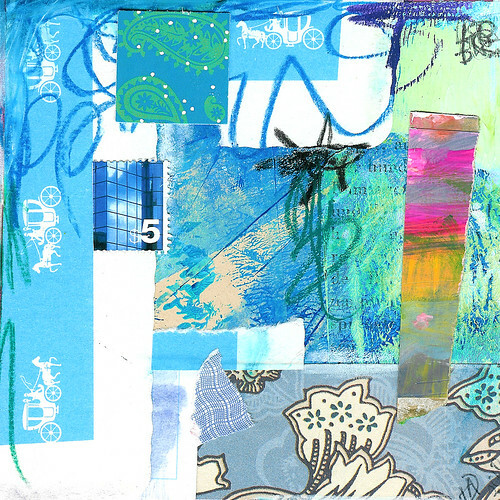 It is exciting each day to to start with a blank card and then see what the finished collage looks like. Everyone loves surprises, right? You also inspired me to decorate in my daily journal and what fun that has been! It breathes life into what may or may not have been a boring entry. Thank you Hanna. Please don’t ever stop inspiring all of us. love your collages… beautiful.. every one!